The world is under the bond of artificial or political boundary. Similar face look between Cambodia and Manipur is something big question hidden behind the tight relations between them. Political boundary makes the regions very far away, however, geographically, culturally, racially, traditionally and historically proximity between the two regions cannot be left behind. For instance, "khudei" a sarong like attire worn by Meitei men is popularly worn by Khmer men too. Women wear "Phanek" in Manipur or a special kind of Sarong or "Sampot" in Cambodia and "haophi" or shawl is worn by Khmer and Manipuri. Loktak Lake is known for the only floating lake in the world. In the same way, Tonle Sap Lake is famous for the only floating village where all the basic needs of a village available there ranging from fishes, foods etc to schools, library etc. Looking on the diet, both people have "utongchak", rice cooked inside the hollow piece or stem of bamboo, fermented fishes etc. In Cambodia bamboo is very popular for the any sort of construction as it is in Manipur. It is very interesting to know the bamboo train is one the most tourist attractions in Cambodia. Bamboo train by name itself shows it is made by the bamboo, has a train service between Battambang and Phnom Penh. The Central Market of Phnom Penh is just like as the Kwairamband Bazar of Manipur where women sell eatable things, clothes etc. It would be very interesting to know if rare and threatened to extinct the Meitei indigenous games like "mukna", "phibul thambi", "phibul thombi", "chaphu thugaibi", "marum konbi" are also played in the forgotten parental worlds. A Mukna played as part of Mera Houchongba on Oct 26, 2007 at Kangla. The study seeks to find out how it is closely related between the regions during the ancient time by analysing the indigenous games of the regions. Indigenous games of Cambodia can be easily seen during the Cambodian New Year Sport Festival as Manipuri plays games during Yaoshang Sport Festival. "Leak Kanseng" (Scarf Hiding): This game is played by a group of children sitting in circle. Those who are sitting are not allowed to turn around or look behind them. One who is holding a "kanseng" or "Karma" (Cambodian towel) or a kerchief/scarf twisted into a round shape runs around the circle while singing a song. The runner secretly tries to drop the "kanseng" behind one of the players. If that chosen player realizes what is happening, he or she must pick up the "kanseng" and beat the person sitting next to him or her. If that player close not hit the player next to them in the direction the runner is going in, or the person who should have been hit will pick up the "kanseng" and hit the unfortunate person whom it was dropped behind with it instead. Then, they come the runner until they can trick someone else. This sort of game is played as an indigenous game of Meitei children, which is known as "phibul thombi" or "phibul habi". "Bay Khom": This game is played by two children in rural or urban areas during their free time in Cambodia. Ten holes are dug in the shape of an oval board in the ground. Forty-two small stones are required to start the game. Five stones are put into each of the two holes located at the tip of the oval board. In each of the remaining eight holes, four stones are placed. The first player selects one of the holes and takes all the stones from the hole and drops them one by one in the other holes. It must be repeated this process until the last stone is dropped into the hole lying besides an empty one. Then he or she must take all the stones in the hole next to the empty one. Similarly, the second player begins to play. The game finishes when all the holes are empty. The player with the highest number of stones wins the game. Such kind of game is popularly known as "marum konbi" in Manipur. "Vay Kaorm": In this game, the player will be blindfold with a scarf. Holding a stick, she or he will hit the clay pot until it breaks. 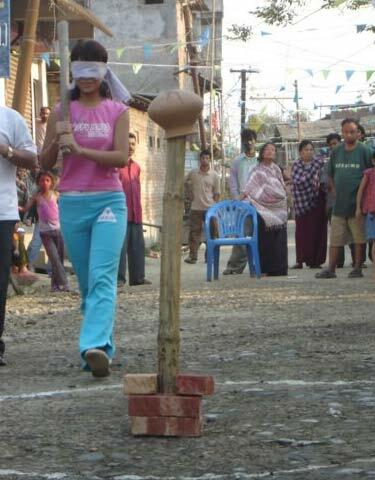 It is a kind of game, which is played in Manipur known as "chaphu thugaibi". However, the different between them is that in "chaphu thugaibi", only one clay pot is kept however, in "vay kaorm", more than one clay pot is placed. If the player can able to hit all the clay pot she or he will win the game and others have to dance in front of the winner. "Teanh Preatt": This game is much same as tug of war known as "thouri chingba" in Manipuri. Girls and boys form two teams. A boy and a girl are chosen to stand at each end of the rope. When the referee shouts "yak-or" and both teams reply "hover" thrice to ensure everyone is already, then the referee rings a bell as which one has been pulled over the line drawn in the ground by the opponent that player is the loser. "Chol Chhung": A "karma" (scarf) is necessary for this game. Knotting the karma as a large ball known as "chhung" with loose edges to grip and throw it. The game is somehow similar with "phibul thomba" in Manipuri. Two teams are needed for the game one time for boys and another teams for the girls. There are two distinctive types of this game. The first type is known as "chhung Rorm chreang" (singing and dancing "chhung") when the boy’s team throws the "chhung" in order to hit any one from the girl’s team. If they cannot able to hit it, they must pick again it up off the ground and throw it. If he is able to hit a girl, She must sing and dance for him. If not, it is the girl team’s turn to hit the boys. If she can hit a boy, he must sing and dance for her. Another type of this game is known as "chhung loh kangom", the rules are the same, instead of sing and dance, if a boy is hit, he must go to he girl’s side and vice versa. Khmer Wrestling: Indigenous game of Khmer wrestling consists of three rounds. Khmer Wrestling is a unique form of the sport as Manipur’s "mukna". Before the match, a ritual dance is participated. The match is accompanied by two drums called "Skor Ngey", which means female drum and "Chhmol"- male drum. The wrestlers always react to the beats of the drums by dancing. To become the winner, the wrestler is dependent on his ability to throw the competitor down and to make sure the competitor’s back lies against the ground. The aim of the game is to force the opponent’s back to touch on the ground. Otherwise, the wrestler wins the match by winning two of the three rounds. After the first round, the spectators will ask the loser, "Horb" (meaning - continue) or "Ngorm" (meaning - stop and accept defeat). Thus, each round the loser is asked if he wishes to continue with the match. "lou" which is used while playing "mukna" is very similar with Khmer wrestling techniques. Apart from these games, there are many similar games like "thuk lokpi", "lik kon sanaba", "cheitek kotpi" played in Cambodia. The relations between regions are, in terms of their indigenous games and sports, very close. Nevertheless, such kind of games and sports in Manipur are threatening to be extinct. Everybody seems to forget to preserve this valuable and close culturally link between the two regions. In genocide torn country, which totally destroyed by the Khmer Rouge, such types of indigenous games are very popular till now with many spectators. These games are promoted specially during New Year Sports Festivals of Cambodia, which similarly falls on the "meitei chahi houba" in Manipur. * Atom Sunil Singh contributes for the first time to e-pao.net. The writer is a Research Scholar of School of International Studies (SIS) at Jawaharlal Nehru University (JNU), New Delhi. You can contact him at atomsunil(at)rediffmail(dot)com . This article was webcasted on June 11, 2008.